This is in the Structures of the Skin section of the health glossary. The papilla is just one of the structures of or associated with hair follicles. See also the links to pages about other accessory structures of the skin. 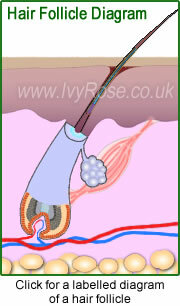 The papilla of a hair follicle is an indentation at the base of the bulb of the hair. The papilla of a hair follicle contains many blood vessels that supply nutrients to nourish the growing hair. The papilla is just one of many structures of or associated with hair follicles. See also the links to pages about other accessory structures of the skin. The topic of the structure of a hair follicle is included in some courses in health sciences, including subjects such as nursing, skin care, hair care, beauty therapy and various holistic therapies.